Staring at a Paul Wackers painting has an effect teetering on the psychotropic. Over the years, the prolific New York-based artist has created an instantly recognisable universe all of his own, often centred around offbeat domestic interiors filled with pert shelves, plants, racks and windowpanes that feature strangely familiar yet completely arcane objects – as if you’re simply looking at a still life of a world only the artist has been granted admission to see. The depth, dimension and texture - not immediately noticeable on a screen - can only be admired in real life. These paintings - and the many wondrous ceramic real-life counterparts the artist seemingly spurs from the canvas - have made Paul Wackers into a red-letter name in contemporary American art. We talked to Paul Wackers ahead of the opening of the show and the book release about new work, being an artist in Tr**p’s America and the mystical disappearance of his early teenage art. PAUL WACKERS: Starting this show, I was trying to get back into making paintings again. For my last New York exhibition in May, I had created art very directly in response to the weird chaos of what’s going on right now. Those were dark paintings, dealing with things that felt very out of my control. With the new show at ALICE Gallery, I think I wanted to remember that I still have my own world around me. I went back to painting things that were more familiar to me rather than tackle world issues in an attempt to have fun with my work again, because the last show felt very brooding and intense, even while I was working on it - the work was a little bit more monumental. KNOTORYUS: The show title is quite remarkable. PAUL WACKERS: I had noticed a little part in a Chris Johanson artwork that said something along the lines of the show's title. It reflected exactly what I was trying to dig up with these paintings. I think I changed a few words, but it’s more or less a quote from that. It's about me looking at the world around me, going: “This is just a tiny piece of everything and everything is a piece of everything else.” The title is kind of confusing to read, but that’s what we are, we’re all just a part of everything. You know? You can’t take yourself out of the equation that much. I like that the name is confusing, but still incredibly present. KNOTORYUS: This is your third solo show at ALICE Gallery, how did you experience that first connection with Alice and Raphaël? PAUL WACKERS: My parents live in the States but they spend half of their time in the south of France, near Toulouse. When Maya Hayuk organised that group show in 2008 and asked me to be part of it, it just so happened that I was already going to visit my parents in Europe when the expo was on. I just showed up. Alice and Raph were lovely and very friendly hosts and then, I don’t know, they just never got rid of me. (laughs) I was here for a month in 2015 as well, working in the space next door to the gallery. That was really fun. KNOTORYUS: You moved studios this year, do you feel like it impacted the work? PAUL WACKERS: It did, yes. I had a large studio in Brooklyn that I was in for five years. For the last show I made a painting that was fifteen feet long. Now I moved into a space that’s a quarter of the previous size. I hadn’t been making small paintings that much because it’s fun to work large like I would in Brooklyn. Now that I was forced to think about scale, the work got smaller and it made me think about the direct relationships going on in the paintings. I’d leave more open space so one object could talk to another one. Allowing some space to digest it. That only happened because I now have to finish an entire painting to start the next one, whereas I used to work on five paintings at once. KNOTORYUS: Coinciding with the exhibition is the publication of this retrospective book, how did you collaborate on that with ALICE Gallery? PAUL WACKERS: We spent a few years saying we should do it and then it just started becoming a reality. I dug up every image of every piece that I’d ever made - without judgment, because I definitely didn’t like a lot of things from the beginning that I’d moved on from. We had the graphic designer, Collin Hotermans, go through the images to see which worked on a basic quality level. I edited out a lot of stuff, Alice took out a lot. They would send me iterations that I’d go through, but I kind of let them choose a lot of the images because I realised that I was a little too close to it. If I had my way, the book would only feature the paintings on show here. “These are what I like right now”. (laughs) I also asked my writer friend Leigh Gallagher to pen something for the book but I didn’t brief her. She just started writing these fictional stories about rooms that take you through the paintings. I was a little disturbed when I read her texts, I felt like she got it a little too well! KNOTORYUS: Did going through all of your work bring back certain memories? PAUL WACKERS: So many of these paintings I hadn’t thought about since I made them. Being forced to look at them, I definitely discovered a few moments in paintings from five, six years ago that came back in this new work. There were all of these themes and little moments or moves that I’d done in one of my paintings that made me go: “I really like that, I should explore that a bit further and see where it’ll take me.” Having to go through ten years of my own work was pretty helpful because I found so many things that I had forgotten the inspiration of. It’s nice to feel refreshed by my own work. KNOTORYUS: Isn’t that the greatest? So how does 2007 you compare to you today? PAUL WACKERS: I don’t know, one of the paintings from the very first show hangs in the ALICE Gallery offices and it’s different in that it’s a little more care-free. A little wilder, I think. There are still a lot of similarities in there, it’s hard to say exactly how it’s different. I’m maybe a bit more graphic these days but I think that comes with having a clearer idea of where I want things to go. I used to go at it with very little plan-making. KNOTORYUS: You mentioned during the last show here in 2015 that you were ‘zooming in’ a lot in the subjects of your work back then, that you didn’t know whether you would zoom out again. PW: And go back to landscapes like I used to a lot of in the mid-2000s? I keep thinking about that. I sort of think a few paintings on show here are like my idea of zooming out. It’s not as a literal, but it’s more in the sense of space, it’s not as confined as with these interiors. I let the edges dissolve sometimes. I think that’s maybe how I’ve gone towards zooming out. I haven’t quite returned to landscape painting yet, like I thought might happen. It’s still possible. KNOTORYUS: There are striking, fantastical qualities about these objects you paint. Have you always been inspired by the real - or imagined - possibilities of your surroundings growing up? PAUL WACKERS: I think so. Where we lived was very suburban and wooded. I’d always be running around in the woods, building little tree forts and having epic adventures in my backyard, going: “That cluster of stones is actually a castle!” There was a lot of projected, invented play. I try to entertain myself with these paintings as well as hopefully give some pleasure to others. In one of the new paintings, you see a red table scenario with all kinds of objects placed on it and I think that when I was making that, I was imagining it being like Giacometti’s sculpture of the city square. I started thinking: “What if these objects are just passing by?”, and I froze them in that moment. I do see them as a whole other world. KNOTORYUS: You’ve mentioned being inspired by Braque or Matisse in the past, now Giacometti, when did all of that classic art appreciation start? PAUL WACKERS: It’s always been there. Growing up, my parents would always take us to museums and galleries. Since all of our family lives in Europe, every summer we’d come over for this grand tour of Paris, Amsterdam, wherever. We’d walk into every church and museum. KNOTORYUS: And you didn’t mind. PAUL WACKERS: I’m sure I did fall asleep here or there, but you know, it’s just always been around so I can’t really remember a time when art wasn’t an everyday part of my life. KNOTORYUS: So when did you start making art of your own? PAUL WACKERS: Later in high school. When I was really young, I’d just run around outside or construct little models and dioramas. In high school I started taking photography and printmaking classes and got a little bit more specific. I was also painting, but those were the most embarrassing paintings ever. I’d just play with colours in my bedroom and let it all mix together. They’re bizarre, I don’t think any of them exist anymore. (laughs) Pretty sure I made them all disappear. KNOTORYUS: Did you have the same art heroes as a high schooler? 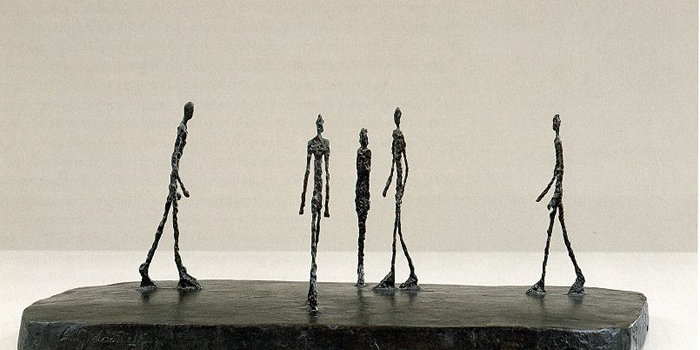 PAUL WACKERS: Giacometti was already a big inspiration. The obsessive quality of his paintings, teasing out that world... Francis Bacon was also huge for me, smearing paint and turning that into a distorted, anguished face. All those things were very otherworldly and beautiful, like something impossible. I definitely tried to copy all of those influences then. Horribly. KNOTORYUS: In the book’s preface, your work is described as having a “secret therapeutic value”. I can attest to that, looking at your work for a while really made me see my surroundings differently. I'd suddenly see this beautiful geometry literally everywhere, in a way I wouldn’t really notice before. Is the process therapeutic for you, too? PAUL WACKERS: I wouldn’t say all of these creations are me working through issues or emotions but I do think it’s in there. There are shapes and objects that I’ve painted so frequently that they’re very familiar to me. They are little friends, like the squiggle lines, I find different ways to give them a stage to play on. I hesitate to say if it’s therapeutic but there is a little bit of taking stock going on, cleaning up certain real-life things within the paintings. “Okay, this is what I can deal with right now.” Sometimes I’ll make a very messy painting that’s super crazy and crowded, but you can still find a moment of peace in it. I think in that sense it’s therapeutic to take a moment, look at the work and things will start to coalesce so you’ll have a way to understand. KNOTORYUS: Do you work at night? PAUL WACKERS: I usually get up around eight, I have a dog. He’s pretty lazy, he likes to sleep in. We’ll take a nice long walk first thing in the morning and get a cup of coffee. Then I’m usually handling e-mails and painting by eleven. I continue to work until six or seven in the evening. It used to be much longer hours, I used to show up at the studio at ten and stay for twelve hours but I realised that wasn’t always very helpful. I need that down-time at the end of the day. Have some time off, refresh, cook myself a nice meal. A pretty simple schedule, but it’s what I do every day. KNOTORYUS: That sounds beautiful. Do you also collect objects when you travel? I read your parents would collect things from all over the world. PAUL WACKERS: I do. Not crazy big stuff, but maybe a little keychain of the Atomium or a rock from the Rio Grande. I like camping so I’m outside a lot, if I see nice stone on the ground, I’ll pick that up. (Takes out small malachite from pocket) This I didn’t find, I bought it in a gem shop. Little things like that I find more interesting than massive tchotchkes or posters. You know where they came from and when you look at them or you touch them, you go back to that place. I’m always gathering bits of stuff and shuffling them around in my apartment. KNOTORYUS: You donated some work recently for Puerto Rico and the Virgin Islands disaster relief. What do you think the importance of being an artist today is, maybe more specifically being an American artist? PAUL WACKERS: A big question. Art maybe isn’t all that important, but I do try to bring a little bit more depth to someone’s day. I think that’s what art can do, if someone is open to it. Being able to be a part of the bigger picture in that way, it just seems like the most natural thing to do. I also have a little web shop that I sell some prints and posters on. I decided that making money is great and very useful, but it’s also a little bit gross sometimes. For some reason, it feels more conflicted because the art is pretty personal and close to me. So when it turns into a pile of money, it seems hollow. So I’ll donate, let’s say, the first 500 dollars from my shop to places like the ACLU or the Sierra Club or whatever charity I actually believe in. Just as an easier way to try to save the world that’s falling apart around me. (laughs) I’m not wealthy but if I can get someone who really wants a painting or print to buy it, then I can just take their money and move it somewhere else so I never had it to begin with, I don’t miss it. It’s a very easy way to be helpful. But it’s tricky, it does cost money to make these things so you can’t always be giving it away. I painted a surfboard recently and that got auctioned off, I was pretty proud of that. Did two things for Puerto Rico this month and then another one for the Southern Poverty Law Center. I’m always happy to help out. I think it’s important to realise we’re all in this together and if we don’t help each other: what’s the point? KNOTORYUS: Do you notice the same kind of sentiment amongst your friends or peers? PAUL WACKERS: I think what helps is that the work I make sort of appeals to a broad audience, so it’s easier to find somebody who might want to buy it to support a cause. I have some friends who make art that would be so inappropriate for a lot of these things. Most artists I know are very community-minded and interested in connecting with people and things. I think in general, people are willing or excited to help out. KNOTORYUS: You’ve created ceramics, prints, installations, abstract India ink drawings, blankets even. Is there a technique or medium that you’ve been wanting to try out still? PAUL WACKERS: I think print-making would be really interesting to explore more in-depth. I’ve really only done screen-printing. I wish I could get access to a really good print studio and also someone who knows how to do it, I think there are so many processes that would be fun to mix together. I'd like to try everything but if I did that I’d never get anywhere. I feel like if you can’t focus, things will never turn into what you want and you’re always just tinkering. I’m limiting myself to ceramics right now because that has so many variables that I’m still figuring out, I’ve been doing it for about six years now and I still barely know what I’m doing. (laughs) You have to confront gravity and general rules of physics. When I’m painting, I’ll make an object and it’s suspended by the smallest connector, I don’t have to worry myself with things breaking or falling. With ceramics, trying to control the drying time and glazes that don’t do what you want them to is a challenge too. I think that every fourth kiln that I fire up, the piece explodes. I just open the door and there’s a pile of rubble. It doesn’t help that my ceramics studio is in a very wet basement. There are always new problems I didn’t know I had. KNOTORYUS: What will you remember about 2017 and what are you excited for in the next year? PAUL WACKERS: This year has been weird, America feels like a very foreign place right now. I think it’s been good in that it’s forced me to stop thinking about myself as much. I’m considering our place in the world a lot more. Amid the terrible parts of it all, a good thing about this year has been seeing what I want to work on or work towards, how I want to help and finding ways to do that with my work. The last show I did in New York had a pretty large piece in it. It was very dark and that’s also interesting about my recent work, trying to speak more to bigger issues in the world. I used to think I couldn’t, I never saw myself as an overtly political artist. It was always very personal or observational. Speaking to broader issues in my work is an interesting development of the past year. KNOTORYUS: How did that manifest? PAUL WACKERS: If I want to make a painting that’s about my life, discomfort and disgust and the terror of the uncertainty that is unfolding, I can. It doesn’t always have to be pleasant. That was an eye-opener. One painting I did had this big battle in it, with a severed arm. I picked pieces outof “Guernica” and put them on a shelf. It’s all in a jumble as if we forgot about the horrors and as the painting moves along there is anguished pain in the middle and in the end the message is that we can find a way out of it. I’m always kind of thrilled that even after having confronted the hundreds of paintings I’ve made so far in my life that I still want to make more. That’s exciting to know, the fact that I’m doing something that I find incredibly fulfilling. I think that’s what I’m looking forward to most in the next year. And maybe a great new studio. The book can be ordered online (€35) via info@alicebxl.com and is available in selected locations. For more info, go here.